Drax files reports on the extensive work of the University of Western Australia to encourage the development of art and videography in a virtual world. "The backbone of the our university's presence in the virtual world is the art and the film. It keeps things alive at all times!" says Jayjay Zifanwe from the University of Western Australia in Perth. A project to merge storytelling with video production. Virtual worlds, video capture and editing software, YouTube, and social media have brought video production within reach of people (formerly writers) who want to tell stories. This article announces the release of a resulting video production. When their DIY mashups of VR headsets and god helmets goes haywire, cyber-lovers, Dylan and Namaka, are plunged into a life-or-death adventure. With their consciousness fused into their avatar bodies, they must find the path back to reality before their physical bodies die. Their quest takes them through beautiful yet deadly worlds. Their appearances change with each new destination along the “path of the rose”. As they defeat villains and overcome challenges, their fear of not finding a way home is replaced by fear they will. Can real life compare to living on the immersive edge? It’s your job to find the way home and bring them back. In cyber, everything’s a lie. To help develop the best beginner instruction for virtual worlds, I collect and report on good examples. Anyone developing their own instruction place can look over the examples and borrow the best ideas. 'Surfing on Ceres', a video collaboration between Fuchsia Nightfire and Gweeb is an entry in the UWA Pursue Impossible challenges. starting prize pool in excess of L$560,000. Just Dance Discotheque! Versitile. Multimedia. 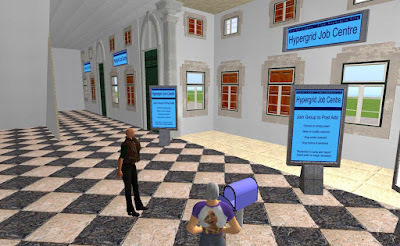 2015 EDU: Escape to a New Way to Learn Spanish, invited post by James T. Abraham, Ph.D.
invited post by James T. Abraham, Ph.D.
Spanish Language instruction on the Hypergrid. College level course offered on a sim. The sim is actively used to teach a Spanish class at Glendale Community College in Arizona. 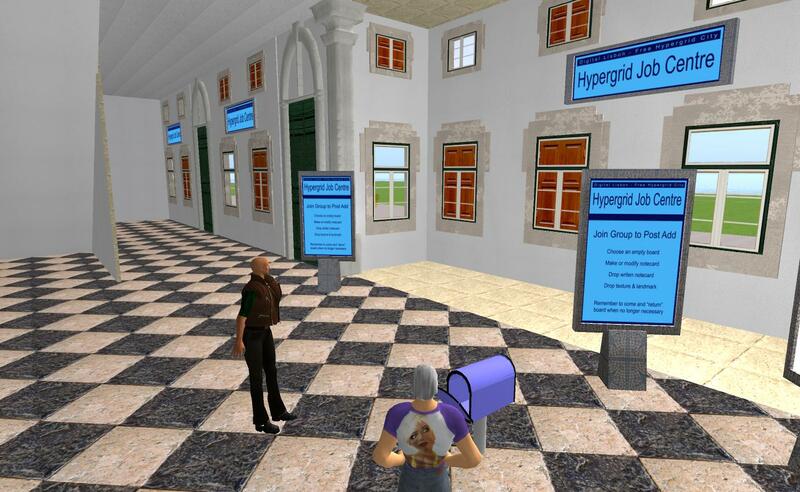 It is also open for use by anyone on the Hypergrid. 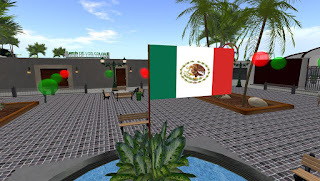 It may be used for self instruction, as an instructional environment for classes, as a source of ideas for other instructors of Spanish, or as a demonstration for others seeking support for 3D language instruction. The WIP show sometimes needs a meeting place where people can show objects running OSSL functions that have a high threat level. Usually these can only be run by the owner of the sim or by a sim manager. Pandora is a region specifically set up to support showing of such objects, so some of the meetings will be held there. 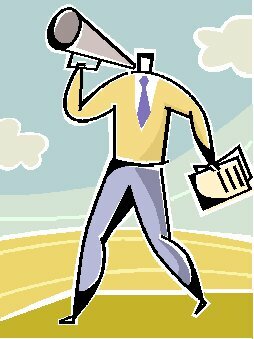 This article presents details of how to get there and present. We (of the WIP organizers) are still learning. 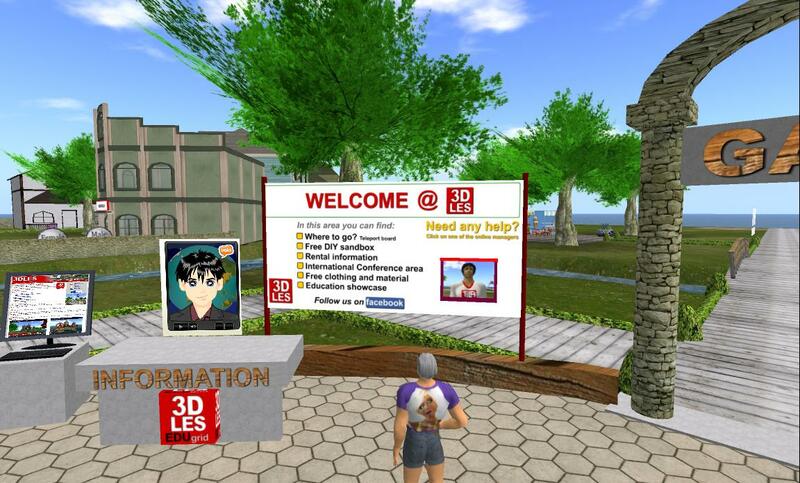 Much work is being done with OSSL functions not available in Second Life. That work cannot easily be shown in Kitely. because of restrictions on who can use the threat functions. Nara Malone has offered her Pandora region as a host for presentations. Pandora is specifically designed for demos of OSSL functions. The grid is also non-commercial, if that matters to you. Meeting time: Noon California time. Next WIP meeting: Oct. 11 at noon California time. If you don't rez fully, edit your appearance or rebake. We need content, MC, and time for second meeting. You got an event you want to promote? Quick check for the Hypergridders. Do you have a graphic? Where will you promote it that your target audience will see it. Have you shown the time frame and time zone.? Have you shown HG address and how to use it? This week is “First Page” poetry based on the first page of your favorite author. Imagine the author started a new book but never finished it. What sort of poem could you make out of just that first page? Use the first page as a prompt, a found poem, a summary or write your own version of the book. 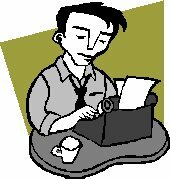 Bring the first page of a favorite book or even one you don’t like, to write your poem. 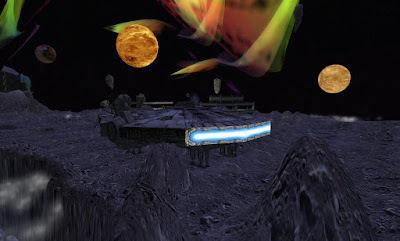 A collection of the works of Arcadia Asylum on the privateer space theme. These works originally appeared in Second Life on a sim with the title Privateer Space. Most of the objects in this display are free to copy or are otherwise available as copies. Arcadia's widely circulated license allow you to do anything with her work except to sell it. On Sanctuary, look in World Map for TSoA 1. TP there. Present information in ways that help people use it. 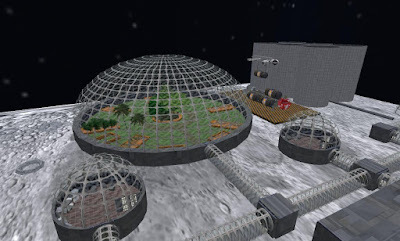 The Ivory Tower of Prims, a well-known teaching build in Second Life, is being rebuilt in large on the Hypergrid. Here is a preliminary look. The late great Lumiere Noir's last build the Ivory City. See the tutorials (still under construction, naturally), in region Uqbar. Life lessons are what you learn when you set out to do things. Not pass tests, but actually reach a real goal. 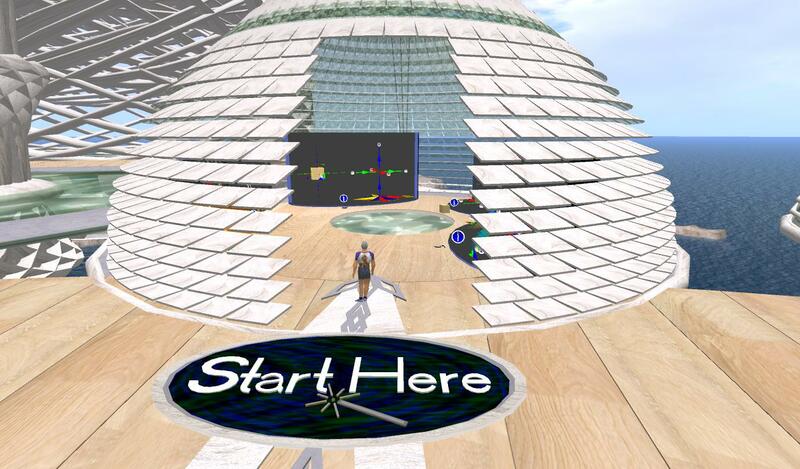 In virtual worlds you can set goals. You can reach the goals or not reach the goals. That's the way it works in real life, too. But in virtual worlds, you get do-overs. You can't get killed. You can't even get mugged, drugged, or beaten. So you can take more risks. Lean things faster. How to research subject matter: internet search and evaluate skills. Interpersonal skills (how to work with other people). Speaking skills (how to present your ideas effectively). 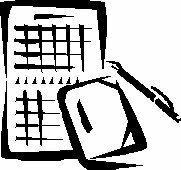 Organizational skills (how to develop an effective plan). Group skills (how to work in a task-oriented group). Self-confidence: if you have all the skills above, you look self-confident. You don't really know something useful until you can do something useful. You get nowhere till you learn to focus on what you can do or learn. Spread the word with your Google stream. Click the G+ button on articles you like. Click the G+ button, recommend articles to people who follow your Google stream. Recommend articles worth reading and people will pay attention. You promote your projects, build your audience, spread your ideas, build your credibility--if you make choices other people find useful. Your Google stream is your personal magazine. People will find your stream worth reading. You will promote ideas you like. You may even promote your projects. AvaHyr, Job world (SL), Virtual Lisbon, etc. Virtual worlds generate jobs: builders, musicians, event managers, video producers, customer relations, designers, photographers, scripters, teachers, animators, translators, writers/editors, marketers, etc. 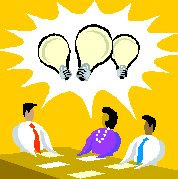 That creates a need for a job mart to help employers find people to do the jobs and to help skilled people find a job. This week the Short Poetry Workshop gets even shorter with Micropoetry, also known as Twitter poetry. Micropoetry has 140 characters or less (like a tweet) and you can use truncated words if you like. If you have land in Second Life, outsourcing your tier may save you money. Selby: Ann Tree Prenyour, one of my mental alts, Insists on a by-line for this article. Ann: I've been critical of people in virtual worlds. I want a chance to say something good. Selby: You mean a promotable idea for making money. Ann: Nothing is promotable long term unless it benefits the customer. Actually, the benefit to the customer is what makes it promotable, at least long term. This idea about outsourcing the tier is promotable that way. And clever. That's why I want to tell about it. Selby: Ok. You can do that right after the break. 2015 TKR: PEOPLE: Does Your Mind Mean Business? Employers are talking more and more about well being and resilience, but few are really clear on how to invest in the minds of their staff. Stress and anxiety levels are continuing to rise - affecting not only our individual health, but also our national productivity. In this excerpt from the event 'Does Your Mind Mean Business' Andy Gibson, author of A Mind for Business and Founder of Mindapples, presents a compelling case for why understanding our minds is now a core skill that is essential for having a healthy and successful life. More from "The Adventures of Luke Skywalker"
Shandon and Caledonia live, in voice!